Seattle is hilly. 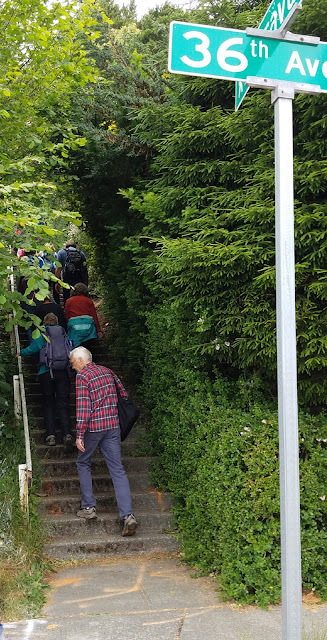 Back in the day, when people walked from place to place, staircases were built to help citizens navigate the hills. Recently, the Auburn Senior Activity Center hikers tackled some of these stairways in the city's Magnolia section. What a workout! My thighs and calves were sure sore afterwards. 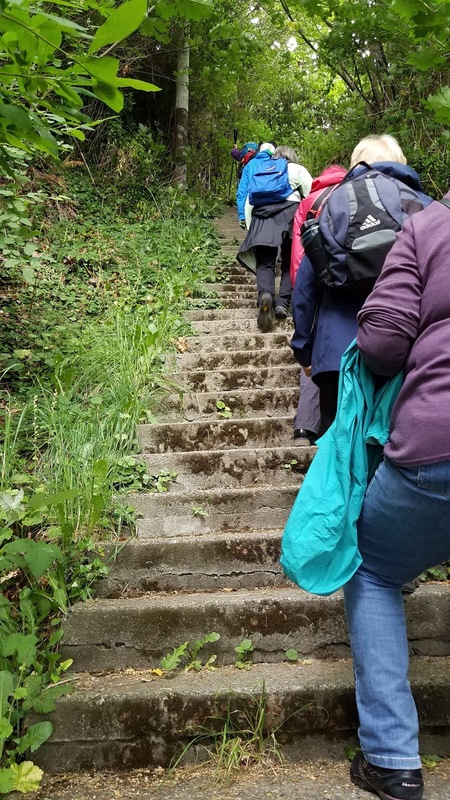 This hike offers spectacular views of the Seattle skyline, Puget Sound, and the Olympics. Historic stairways provide 327 steps down and 405 steps up. 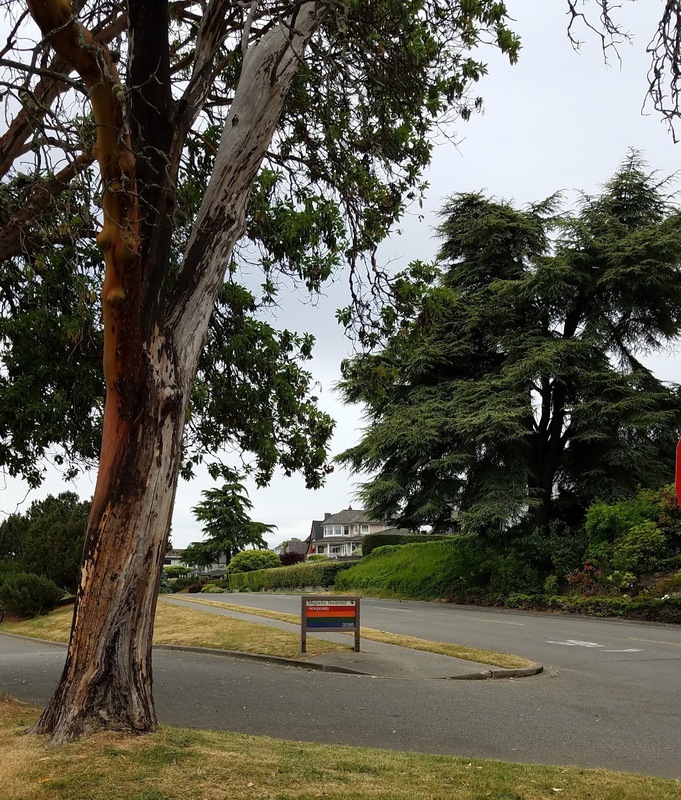 The route winds through a variety of neighborhoods from high end custom view homes to post WWII housing. 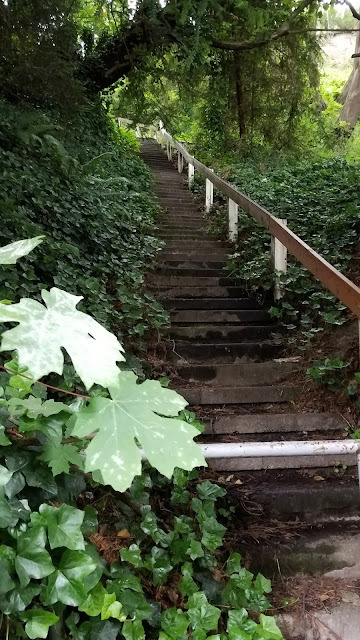 The longest flights of stairs connect Perkins Lane, site of destructive landslides, to Magnolia Blvd. After completing the entire hike we will have the opportunity to dine in one of the many Magnolia Village restaurants. Here's a sample of the ups and downs we experienced on this cool, overcast day, as well as views along the way. 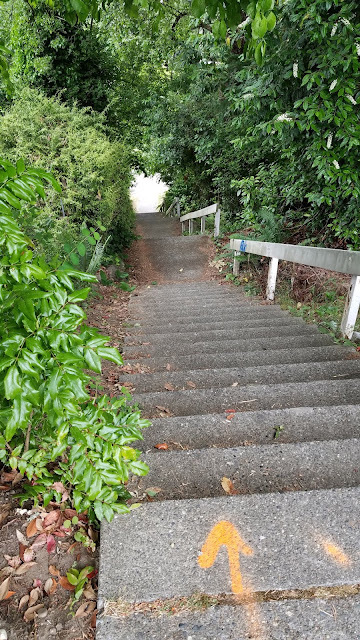 Some of the stairs led us to beautiful neighborhoods. 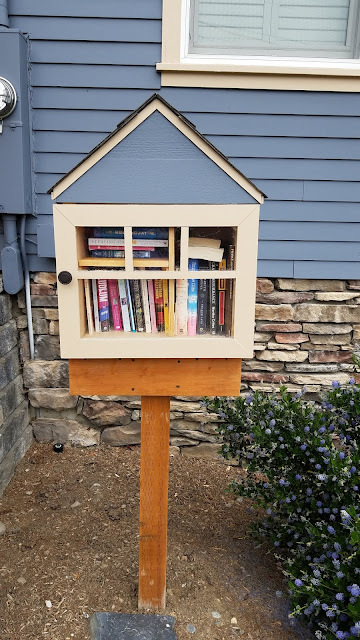 It's always fun to come across a little free mailbox. Cruise ships. Sailing for Alaska? You'll find an interactive map of Seattle's stairways HERE. This past Tuesday I went on a lovely walk through the Olympic Sculpture Park on the Seattle waterfront. The site was a former fuel storage and transfer facility, and clean-up of the contamination began in the 1990s. The sculpture park opened in January, 2007, and is part of the Seattle Art Museum. It overlooks Elliot Bay of Puget Sound. Olympic Mountains in the background. Clever bench design. I don't know the artist's name. 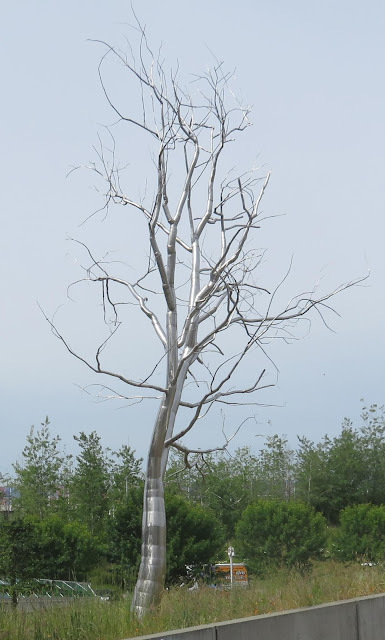 This kinetic sculpture moves in the breeze. An inviting rose garden, too. 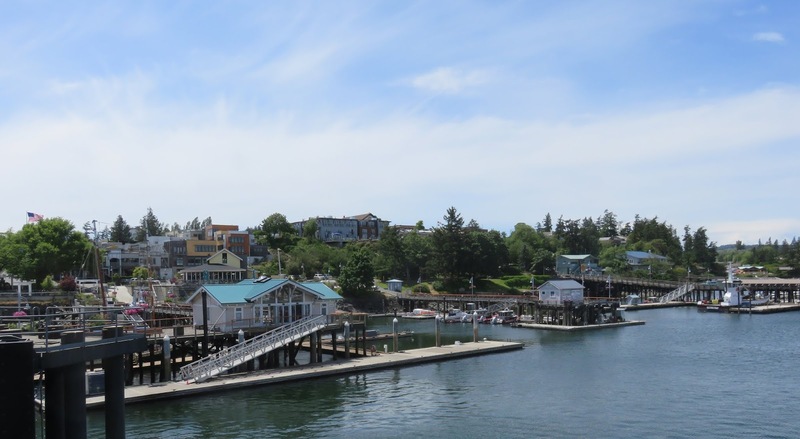 Called "The Gateway to the San Juans," Friday Harbor is one of those places I've been wanting to visit ever since we moved to Washington State. This past week that finally happened. We traveled with a group from Auburn to Anacortes, Washington, via bus and then walked onto the ferry and sailed to Friday Harbor. Here are a few photos of this charming town. The town of Friday Harbor, viewed from the ferry dock. San Juan Island boasts a population of just over 2,000 people. We had limited time on the island (day trip), so we had to set some priorities. First thing: visit San Juan Vineyards! We hired a taxi and headed for this charming winery out in the countryside, about 10 minutes from the ferry dock. but it looks like it's always been there. This small winery offers only four selections (fruity white wines) and they can only be purchased on the island. We tasted them all and brought home four bottles. After our wine tasting, we taxied back to town, had lunch, and ate an ice cream cone before boarding the ferry for our return trip. Views from the ferry ride. The day started out overcast but slowly cleared and turned into a beautiful afternoon. I'd like to come back again and spend a few days at a B&B, take a whale watching excursion, explore the town's many museums, and sample its restaurants. One afternoon definitely wasn't enough.